plant at Hankinson, ND. Photos by Rob Siverson, Fargo, ND. From the day it began manufacturing ethanol and distillers grains in 2008, Hankinson Renewable Energy’s 132-million-gallon-per-year (MMGY) plant in Hankinson, ND was designed for fast turnaround. Company managers credit this outstanding performance to the operation’s high degree of automation, notably the plant’s SmartTruck loadout management system from CompuWeigh Corp., Woodbury, CT (203-262-9400), which was specified during the plant’s construction. Plant Manager Wes Plummer comments that a similar CompuWeigh system exists at Hankinson’s sister plant in Hereford, TX, and managers were impressed with its performance and with the degree of support the manufacturer provided for it. • Receiving corn brought to the plant by truck. • Loading both distillers wet and dried grains (DDGs) onto trucks and railcars. • Providing data through an interface to the plant’s Great Plains accounting software. While it can be configured for a completely unmanned receiving operation, Hankinson uses its SmartTruck system in a partially manned operation focused on a pair of inbound and outbound scales. When truckers first begin to deliver grain to Hankinson, they are issued an RFID card. 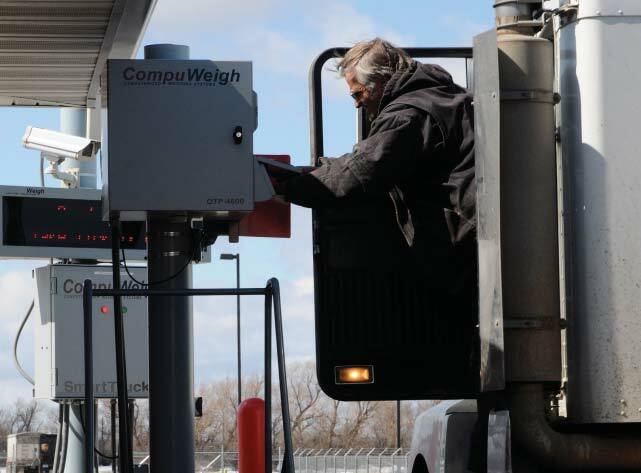 When a trucker arrives with a load of corn at the receiving area, a CompuWeigh SmartScan reader scans the card, captures the data, and stores it as part of a transaction record. The card identifies the hauler to the scale operator and can pull up any special orders applying to that specific driver or account. Meanwhile, the truck is probed for a grain sample. Then, the driver is instructed by a SmartView message board to proceed onto the inbound scale. The scale operator makes note of the driver identification and vehicle gross weight and grades the sample. Any order information such as product, intended destination, gross weight, etc. can be displayed in bright red letters for the driver to confirm on a SmartView message board positioned adjacent to the scale. An image of the truck is recorded for the transaction, the traffic control light turns green, and the message board directs the driver to the correct receiving pit. Hankinson operates two truck receiving pits. 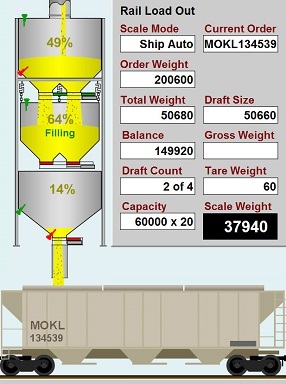 Thiele notes that by being able to view grade and weight on the message board, the driver has the option of taking the load home for more drying, for example, instead of automatically depositing the load into a receiving pit and taking a dockage on the price. After the driver empties the load into the correct pit, he or she proceeds to the outbound scale, where another SmartCard reader scans the driver’s RFID card. The transaction is opened without any user input required, photo eyes identify the truck and confirm it is on the scale, and the outbound weight is taken. The system computes the gross, tare, and net weights. Then, a CompuWeigh OTP-4600 printer prints out a scale ticket with final weight and grade. The message board instructs the driver to exit the scale, and the transaction is complete. Overview of Hankinson Renewable Energy’s 132-MMGY ethanol plant. Loading DDGs onto trucks follows a similar procedure with the SmartTruck system. In this case, it’s an empty truck that pulls onto the inbound scale for weighing. Afterward, the SmartView message board sends the driver to the correct loadout bay. At the loadout bay, the driver tells the loadout operator what he or she wants. For example, the order might call for 50 tons of dried distillers grains, with 30 tons concentrated over the rear axle. Then, the driver proceeds to the outbound scale. If the weight turns out to be incorrect, the system can send the truck to a receiving pit to drop some of the load or to the loadout bay for more DDGs. If the weight is good, the driver gets a receipt from the scaleside printer. Plummer comments that the system also includes a CompuWeigh SmartLink data interface linked to the plant’s Great Plains accounting system. This interface includes a scheduler that regularly extracts ticket data and creates an export file to send to the accounting system. The accounting software, in turn, uses that data to create settlements, track performance against contracts, and create monthly reports for facility managers to review. “This interface eliminates the need to re-enter a lot of data manually, and that saves a lot of time and labor and eliminates some possibility for human error,” Plummer says.